Like "Loser," this song was a collaboration with Carl Stephenson and can be found on Mellow Gold. Beck brought the song to his sessions with Karl, and the two turned it into a funky, rocking track that is easily one of the major recordings of all of Beck's early work. Interestingly, Beck released as a b-side another take of the song called "Soul Suckin Jerk (Reject)". Beck's story revolves around a character who is working at a mini-mall, before getting completely fed up and going on a little adventure starring cops and hookers. It is a very entertaining tale, mixing broad autobiographical experiences with specific fiction. 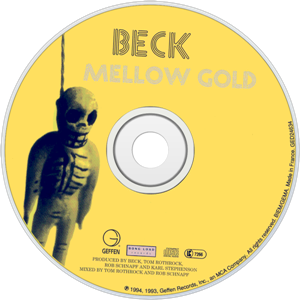 Despite being one of the centerpieces of Mellow Gold, the song never quite hit that status during the live shows. The live performances are a pretty cool mix of psychedelia, rock, and rap, though they often also tended to be sloppy. The version on March 30 1994, was almost unrecognizable at the beginning. Beck tries to rap over a thumping beat, but gets lost in the lyrics, and ends up adlibbing some stuff. (Unfortunately, it's hard to make it all out.) The chorus is done falsetto, before picking up intensity for the second verse. Beck nails that verse, and the song has sort of fallen into shape. The song ends in a strange breakdown. A few months later, Beck had taken his tour over to Australia, Japan, and China. I don't know of too many boots from this trip, but on September 6 in Tokyo, "Soul Suckin Jerk" starts the set. These versions are much more together than the one on March 30. It is a fuller arrangement now, with keyboards and effects and guitars. Beck still tends to stumble through the lyrics most of the time though. ??? slice and dice, a tupper player's in ?? After that first verse, he reverts to the "Soul Suckin Jerk" chorus. He does a proper "Soul Suckin Jerk" verse after that though for the end, so the song returns to normal. It has not been played live in quite awhile, probably not at all since the end of 1994.